I don’t know why I felt a loss when I heard that Michael McGinnis has moved from California to Washington State, but I did. A man’s life and work are not defined by geography, but I will miss his presence at folk music gatherings here. Who is he? He’s certainly not at the top of folk music stations’ playlists but to me, when someone says the word ‘folksinger’, Michael’s image pops into my head as quickly as the image of a steaming pizza does when someone says the word pepperoni. Bits and Pieces is Michael’s latest in a long list of releases and it consists of a group of songs gathered from here and there, yesterday and today. From a 1976 folk club performance of Tom Paxton’s Ramblin’ Boy recorded live at a ski lodge, to a heartfelt rendition of the Hugh Prestwood epic The Song Remembers When, then to the haunting How Can I Keep From Singing plus others, original and not. The CD is produced and features Michael along with longtime friend and master musician David P. Jackson. More about David further on. Some may enjoy production and background or perhaps prefer traditional instrumentation but none of that matters when you listen to Michal McGinnis sing. You are listening to more than seventy years of singing by a guy who can’t hide his flaws and emotions or his ability to pour his heart out to you completely. Good and great singers abound, especially in this town, but this is the voice of a real person and the raw thread shows through the fabric and can’t be hidden with styling. He is standing directly in front of you and you can touch him. You can’t deny him his space nor his humanity. Whether he is singing a song he’s written or someone else’s truth, Michael McGinnis kills you dead with honesty. Since McGinnis is not a household word in our community, perhaps a bit of background and profile will help flesh out this phenomenon of musical history wrapped in one humble servant of the craft who values the song he’s chosen to sing over everything else. And perhaps this is why quality musicians are drawn to him. Los Angeles bass icon David Jackson for whom no bass challenge is too great, is almost always by his side on stage and in the studio, lending his magical support with bass, accordion, and vocals. A word here about my history with Michael. I usually do not include too much background material in a single CD review, but Michael is rare and unlike so many others who abandoned career to pursue other interests after the wave of ‘popular’ folk music faded in the late seventies (include me in that category), Michael continued singing because that was who he was and that is who he is. When the crowds stopped listening to folk singers and moved on, Michael moved on to singing for skiers in Aspen, and for YMCA children’s camp gatherings where he still sings for the children with the same passion that he would for any sophisticated audience. Never a question in his heart of who he was – is – and what he does. Listen to him. You will understand. From grade school in Illinois, continuing through his college years slogging through coffee houses, bars and halls eventually ending up in the early and mid-sixties Los Angeles folk music scene as one of Randy Sparks’s cadre of folksingers. This is where I first met him. At the time, I was the unofficial musical director of The New Christy Minstrels and I first hired Michael to replace the gruff voiced Barry McGuire in the New Christy Minstrels once McGuire left the group and moved on. Mike had the spirit, the rawness even if I didn’t know at the time if it was natural or manufactured. When the gravy train of early sixties folk phenomenon ended, Michael continued, and his credits reflect the saga of a true road warrior. He is an actor, a folksinger and a storyteller who has performed with and directed music for many artists. His tenure with The New Christy Minstrels took him to The Andy Williams Show, The Dinah Shore Show and The White House. He has also toured with his own band The Rodeo Gypsies, has several major label recordings to his credit and was the first artist to produce a full length music video for EMI Video. Don Henley, Michael McDonald, Wayne Newton and Captain Kangaroo have recorded his songs. For the reader who has never heard or seen this remarkable artist, Michael has given me permission to post the following excerpt from a previous CD It’s All Good. The Great Kansas Hymn has become Michael’s ‘signature piece’ to many. The Song Remembers When – (Hugh Prestwood) – This song has been recorded by many artists, but Michael’s rendition is my favorite. 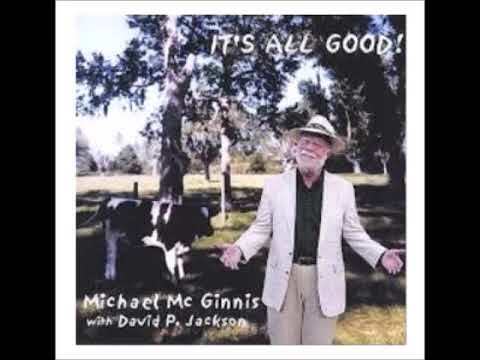 She Danced In The Kitchen – (McGinnis) – A song about Michael’s mother and one of his most successful songs. If there is such a thing as a breakout single any more, this one is it. Michael plays piano on this one. If You Could Only See Me Now – (McGinnis) – Another of this reviewer’s favorites. Great imagery. Midnight On The Water – (Lewis Thomasson) – An old fiddle tune featuring legendary fiddler David Fox Watson, re-recorded with Watson’s original fiddle parts. **David Jackson: Not enough can be said about David Jackson’s understanding of a musician’s role and a producer’s role in any project. His musical support, whether it is on his trademark and favorite acoustic bass guitar, accordion, or just supplying background tracks, his taste and expertise is second only to his loyalty to a friend and his music. David is a member of the L.A. western swing band New West, the be-bop ensemble Mood Indigo and is in high demand especially when the average bass player is overwhelmed. Album was produced by Michael McGinnis and David P. Jackson for Shadow Hills Records. Engineered and mixed by David P. Jackson at Studio Dave except Love So True which was mixed by Matt Quave. Remastered by W. Michael Lewis at Wombat Music.